"A good houseplant is next best thing to a live-in housekeeper. They add a little pizazz and cosiness wherever you place them, and they can even help you get a better night's sleep. With help from Houseplants for a Healthy Home … get ready to grab your gardening gloves and take a big, deep breath of fresh air (in your bedroom)." "In these turbulent times, there's one thing we can all agree on: Houseplants are magic. They can clean the air in your apartment and even grow in low-light conditions. 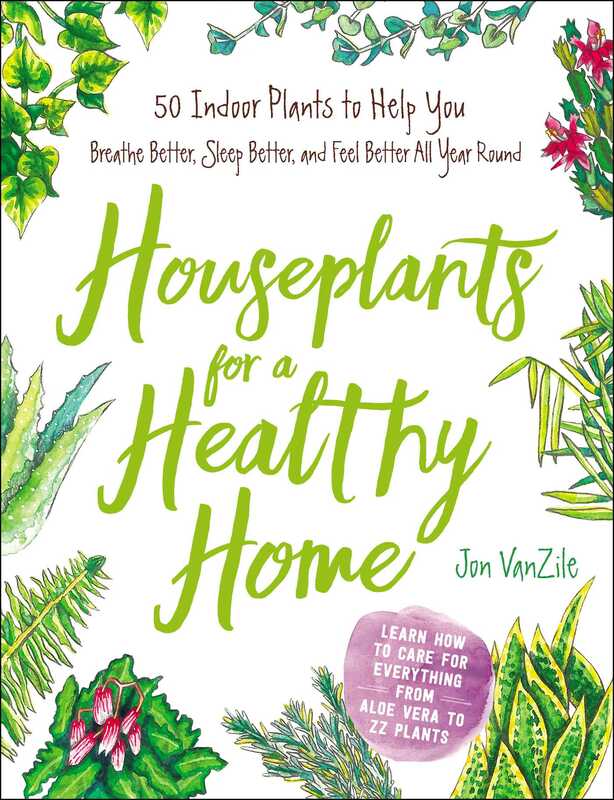 And according to Jon VanZile's new book, Houseplants for a Healthy Home, houseplants can even help you sleep better. Take that, iPhone app that tells me what I already know (last night, you tossed and turned!)." "Fact: Plants work wonders at sprucing up a decor scheme. But did you know that some can literally make you feel better, too? No for real—it’s backed by science. We consulted the new book Houseplants for a Healthy Home for ten beautiful, living, breathing decor additions...that also have surprising health benefits." "If there's an indoor gardener in your life or you're looking for a nice add-on to a growing gift, Houseplants for a Healthy Home by Jon VanZile provides details on caring for fifty different types of indoor plants. There's also info about the health benefits of living with plants and general advice on maintaining houseplants." "As much as I love creative garden ideas for outside, I love them even more for my indoor plants too! I’m learning so much from this book about the specific health and wellness benefits of popular houseplants while introducing you to new favorites bound to brighten your life. With plant-scaped rooms popping up all over Pinterest … houseplants are the hottest home accessory right now—and for good reason." "This book really is SUCH a help and so much fun to read. The illustrations are pretty and this really explains the world of plants for those of us who really just don't get it. Sort of like plants for dummies. This can be very helpful when setting your home up for good Feng Shui." "Beautifully illustrated hard-back book about plants … .Master gardener Jon VanZile not only tells how to take care of houseplants, but writes about plants that are good and useful for the grower from cleaning the air to using in tinctures and tonics." "If you're looking for ideas as to which houseplants are most beneficial for you and your family, this next book is a great source." "It’s easy being green — and healthy, too. Everyday plants in your home — yes, the kind in pots on your windowsill or desk — can result in physical and mental benefits … The purported boons of specific species are laid out in a new book Houseplants for a Healthy Home. Wellness expert Jon VanZile compiles fast facts on the exact advantages, from heart disease prevention to asthma relief, attributed to each type of flora and its associated lotions and tonics." "I highly recommend finding a book to help you select and care for plants that will fit your lifestyle the best. Houseplants for a Healthy Home is a book that does just that." "For a lighter read, Houseplants for a Healthy Home is an illustrated encyclopedia of easy-to-grow houseplants, annotated with each plant’s health benefits and detailed care instructions." "With color illustrations throughout, this charming compendium covers a veritable alphabet of beneficial plants, from sunburn-soothing aloe vera to toxin-removing Zami­oculcas zamiifolia." "For decades we have known that plants filter and clean the air we breathe, soak up carbon dioxide and, in turn, give back oxygen. VanZile shows us how to make this come true with 50 specific tropical plants that clean our indoor air ... and have healthful and healing effects on our bodies. Houseplants for a Healthy Home is a great little reference book. It is a fast and fun read crammed with important information. Buy it! You’ll love it!"